Introduction : Choroidal masses present a great diversity of etiologies. Accurate diagnosis of these tumors is often challenging as their signs are not specific. The purpose of this study was to investigate the most relevant clinicopathological manifestations of different benign and malignant choroidal tumors in order to tabulate appropriate diagnostic approaches. Observations : Three patients aged 7, 29 and 32 years old presented with visual acuity deficit due to a unilateral unifocal yellowish choroidal lesion. For etiological diagnosis, ancillary tests including ultrasonography, fluorescein angiography, indocyanine green angiography, computed tomography, and magnetic resonance imaging, were performed. Despite the similarity of clincopathological manifestations, etiological diagnosis was different in all these cases : Tuberculoma, metastasis and Circumscribed Hemangioma. Discussion : Choroidal masses include a diverse array of clinical features ranging from life-threatening malignant melanomas and metastases to an innocuous nevus or hemangioma. Ancillary tests should be considered to eliminate the possibility of malignant disease. Many lesions may be confused with primary or secondary malignancies like choroiditis, choroidal osteoma, choroidal hemangioma, choroidal neovascularization with disciform scar and posterior scleritis. Conclusion : Problematic differential diagnoses include malignant versus benign choroidal masses. Conventional and appropriate diagnostic tests should be performed routinely to lead to an accurate diagnosis. Choroidal tumors comprise a diverse group of benign and malignant lesions. Owing to the abundant vascular supply of choroid, it is the most common ocular site for metastasis of systemic neoplasm. It also involves several infectious granulomatous diseases due to an easy spread of infections to this highly vascular layer. Furthermore, many congenital vascular malformations occur in the choroid. Considering the innumerable causes of choroidal masses such as infection, inflammation, malformation or neoplasm. Diagnosis is often challenging, as their signs and symptoms are not specific. Figure 1. Fundus biomicroscopy of choroidal granuloma. 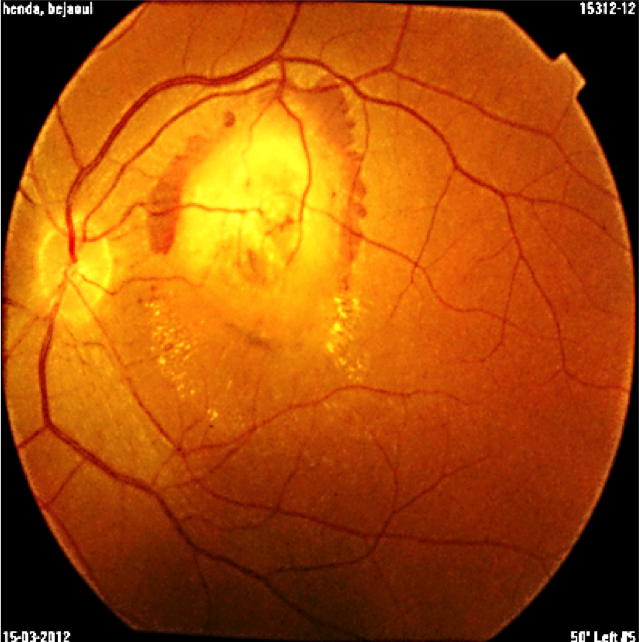 A single well-defined, yellow choroidal mass in the left eye with dimensions of 15 × 20 mm located in the posterior pole beneath the superotemporal arcade, surrounded by a circular band of hemorrhage. Exsudates and subretinal fluid was adjacent to the lesion. The purpose of this study was to investigate the most relevant clinical features of the main choroidal tumors (metastases, circumscribed choroidal hemangioma, and tuberculous choroidal granuloma) to improve knowledge of these lesions with the aim of ameliorating diagnosis and treatment especially for malignancies. Figure 2. Fluorescein angiography phases of choroidal granuloma. Fluorescein angiography frames showed initial inhomogenous hypofluorescence and late hyperfluorescence. A 29-year-old asymptomatic woman was referred to our department for a suspected lesion which was incidentally discovered on funduscopic exam. Patient interview didn’t find a personal medical history of systemic neoplastic disease. Physical examination revealed a thin, tired-appearing woman but was otherwise unremarkable. Her best corrected visual acuity was 20/20 in the right eye and 10/20 in the left eye. The anterior segment of both eyes was normal without signs of inflammation. Vitreous was normal with no cells or haze. The only positive finding of complete ocular examination was a single ill-defined, yellow choroidal mass in the left eye with dimensions of 15 × 20 mm located in the posterior pole beneath the superotemporal arcade, surrounded by a circular band of haemorrhage. Exudates and subretinal fluid was adjacent to the lesion. (Figure1). Fluorescein angiography disclosed initial inhomogeneous hypofluorescence and late hyperfluorescence (Figure2). Optical coherence tomography showed that the increased thickness of the retina was related primarily to the hyporeflective intraretinal cavities (Figure3). The lesion remained hypofluorescent throughout the indocyanine green angiography (Figure 4). Figure 3. Optical coherence tomography of choroidal granuloma. Optical coherence tomography showed an increased thickness of the retina with hyporeflective intraretinal cavities. Ocular ultrasonography showed a solid elevated mass. Her laboratory investigations revealed normal haemoglobin level, normal total leucocytes count and a raised Erythrocyte Sedimentation Rate (50 mm in first hour). 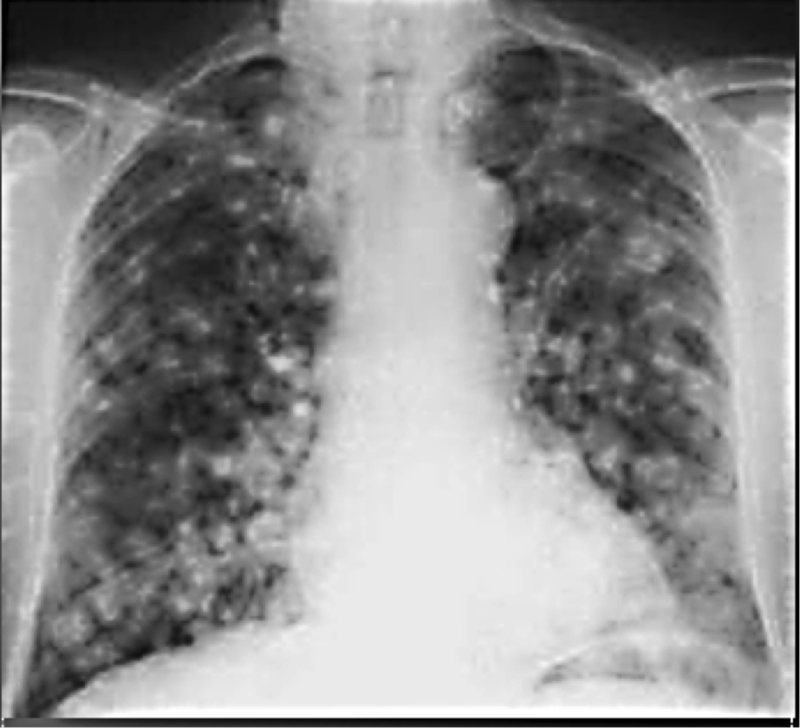 A chest radiograph showed patchy opacities in both lungs (Figure 5). Mantoux test revealed an induration of 12 mm after 72 hours. Sputum smear was found positive for Acid Fast Bacilli. Based on bacteriological, radiological findings, diagnosis of solitary tuberculous choroidal granuloma secondary to pulmonary tuberculosis was established. Then standard treatment for tuberculosis using four first line drugs (isoniazid, rifampin, pyrazinamide, and ethambutol) was given to the patient for a 2-month initiation phase. After this period a follow-up examination showed a resolution of the signs and a 4-month consolidation phase was followed using the two first-line drugs (isoniazid and rifampin). A 32-year-old woman was presented with a rapidly progressing blurring of vision in the right eye over 2 weeks. She had no history of prior non-ocular cancer or no concurrent extra-ophthalmic foci of possible primary or metastatic malignancy. On examination, her best corrected visual acuity was 1/20 in the right eye and 10/10 in the left eye. Fundus examination revealed a creamy unifocal round choroidal mass in the right eye associated to a macular serous retinal detachment (Figure 6). Fluorescein angiography showed a relative hypofluores¬cence of the lesion in the early frames with few thin-caliber intralesional vessels, and a diffuse hypofluorescence of the lesion in the late frames (Figure 7). Indocyanine green angiography reveals a hypofluorescent lesion throughout the study (Figure 8). Ultrasonography provided us supportive evidence of unilateral unifocal choroidal mass typically with a high internal reflectivity (Figure 9). Magnetic resonance imaging appearance of the lesion is an iso-signal T1 weighted, and a low signal in T2 weighted (Figure 10). Our initial differential diagnosis included choroidal metastasis, amelanotic choroidal melanoma, choroidal granuloma, and posterior scleritis. A systemic evaluation was undertaken to detect a primary neoplasm or granulomatous disease. Physical examination found a lump in region of left kidney. 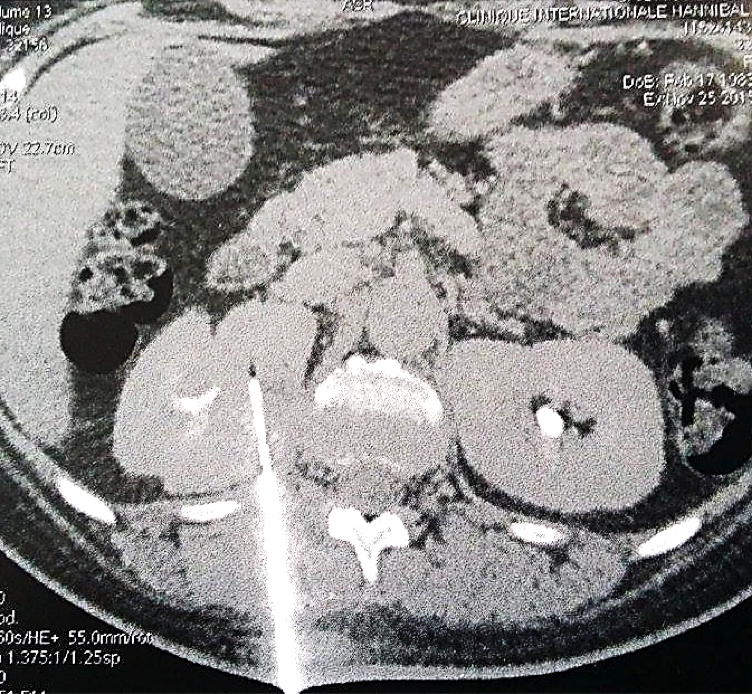 Complimentary investigations by hole body CT-scan had shown a metastasis in the right lower lobe and a left supra renal tumor (Figure 11). Biopsy findings had shown a renal cell carcinoma. A 7-year old child, without relevant history, was presented with a decreased vision of the left eye for more than 3 weeks. Upon exploration, he exhibited a reduced corrected visual acuity to count fingers in the left eye, with an anterior segment examination, reflexes, motility and tonometry of within normal values. The same eye fundus revealed an orange mass in the macular area, with ill-defined edges which produced an infra-jacent retina raising (Figure12). Fluorescein angiography showed irregular hypo-fluorescence in early times with a late hypo-fluorescence pattern. In late phase of ICG angiography there wasn’t the wash out phenomenon (Figure 13). Ultrasonography B scan revealed a dome shaped choroidal mass with a homogenous echoic echo structure and a lacy network of intrinsic vessels (Figure 14). T1-weighted MRI showed a hyper-intense signal of the choroidal tumor (Figure15). Considering the clinical conditions and supplementary tests, the diagnostic was toward circumscribed choroidal hemangioma after a differential diagnostic mainly with choroidal melanoma and choroidal metastasis. Figure 7. Fluorescein angiography of choroidal metastasis. 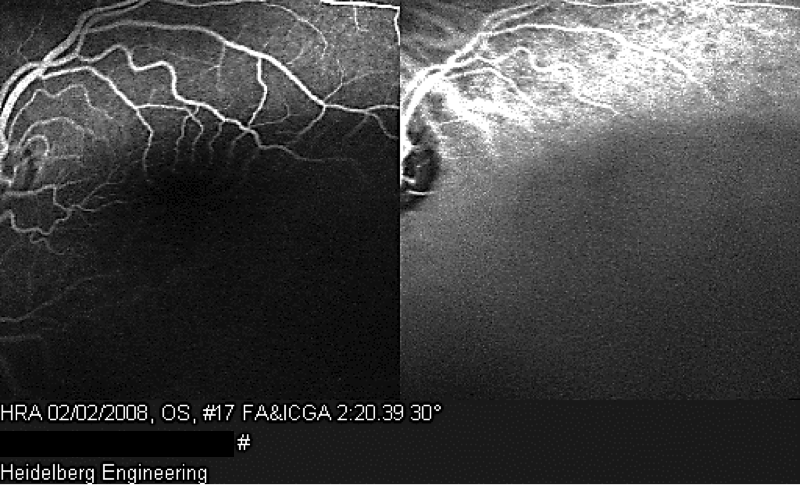 Fluorescein angiography showed hypofluores¬cence in the early frames and a diffuse hypofluorescence of the lesion in the late frames. Choroid is a vascular structure that provides up to 85% of the ocular blood flow . This layer is the subject to a variety of diseases and disorders like choroidal masses which include a diverse array of clinical features ranging from life-threatening malignant melanomas and metastases to an innocuous nevus or hemangioma . They often become a diagnostic dilemma for the clinician and many lesions go wrongly diagnosed. Thus, clinician should be cognizant of the fact that a primary or secondary malignancies of choroid can mimic the fundoscopy aspect of choroidal benign tumors such as infectious or inflammatory granuloma or circumscribed hemangioma . Choroidal metastases are the most common intraocular tumors of adults . Autopsy studies suggest that approximately 10% of cancer patients have ocular metastases, most frequently to the choroid [4, 5]. This predilection for choroid may be explained by its rich terminal vascularization . However, they are rarely seen by ophthalmologists as these patients tend not to experience visual symptoms . Pathologies such as breast cancer are associated with higher rates approaching 40% late in the course of the disease . While lung cancer is considered to be responsible for no more than 7% of choroidal metastases . An extremely important diagnostic clue is a history of known primary tumors. Most patients who develop metastatic cancer to the eye have a known prior cancer capable of metastasizing and frequently other known sites of metastasis as well . However, as presented in our case, approximately 25% of individuals who are found to have metastatic cancer to the eye develop that condition as the initial manifestation of their cancer . Therefore, the tumor cannot be easily distinguished from the other causes of choroidal masses because of unknown primary cancer at the time of ophthalmologic examination. Shields et al have demonstrated that 34% of patients with choroidal metastasis have no history of primary cancer at the time of diagnosis . Many lesions may be confused with choroidal metastases, like choroidal melanomas, choroidal osteoma, choroidal hemangioma, choroidal neovascularization with disciform scar, posterior scleritis, and other rare lesions . Metastatic tumors usually have a creamy yellow appearance, plateau or dome shaped, infiltrating, rapidly progressing, associated with secondary retinal detachment with sub retinal fluid and are generally located at the posterior pole . Purely amelanotic lesions are more likely to represent amelanotic choroidal melanomas. Metastatic lesions are usually flatter and rarely show the mushroom-shaped configuration that is often seen with melanomas . In a study  of 60 eyes with choroidal metastasis 96% of these tumors were judged to be yellow and/or creamy. Somehow pigmented choroidal metastases from breast and unknown primary sources were present in only two cases. Brown-colored metastatic tumors are usually secondary to metastatic melanoma from both cutaneous and controlateral choroidal sources; however, very large tumors originating in the breast, lung, and gastrointestinal tract occasionally assumed a light brown colour. Choroidal metastases are also generally located in the posterior pole. Metastatic lesions anterior to the equator and metastases that involve the ciliary body are uncommon, and therefore amelanotic choroidal melanoma is more likely to be diagnosed in those locations . Figure 10. Magnetic resonance imaging appearance of choroidal metastasis. Magnetic resonance imaging appearance of the lesion is an iso-signall T1 weighted, and a low signal in T2 weighted. 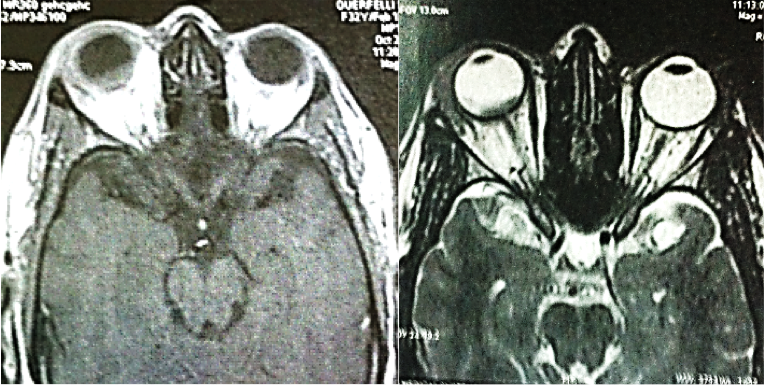 Bilateral and multiple choroidal tumors are very suggestive of choroidal metastasis . Since many simulating lesions tend to be unilateral and unifocal . Thus, unilateral lesions are harder to diagnose, as described in case2. 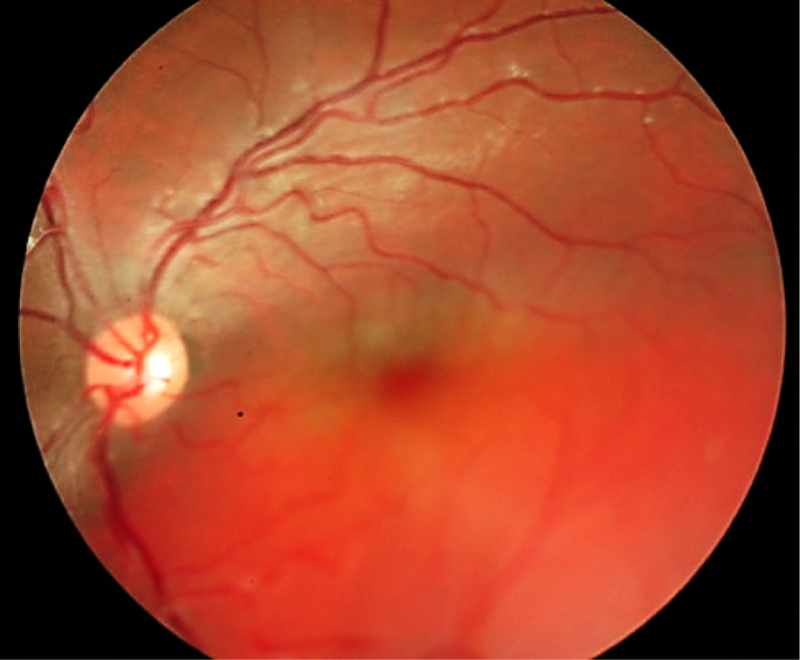 Although some inflammation may be associated with choroidal metastasis, inflammation is generally not prominent, but it can be seen, sometimes associated with choroidal detachment. Several inflammatory conditions which can be presented as choroidal masses should be distinguished such as posterior scleritis, infectious and inflammatory granulomas . In such cases additional tests are required to confirm the diagnosis. Combined A and B scan ultrasonography is of a value in differentiating metastases from primary choroidal melanomas. In the A-scan ultrasonogram, metastatic lesions usually have a high internal reflectivity whereas choroidal melanomas usually have lower internal reflectivity . The B-scan ultrasonogram shows an echogenic subretinal mass with ill-defined borders and a sound attenuation in the lesions is usually moderate . Magnetic resonance imaging may also prove to be valuable in differential diagnostic aids. In fact, this lesion tends to be iso-hyperintense on T1 weighted images and hyperintense in T2 weighted images with heterogeneous enhancement with gadolinium. Because of their high levels of proteins or haemoglobin degradations products, choroidal metastases from a mucin-producing adenocarcinoma and haemorrhagic metastases can mimic signs of melanoma at MRI (T1 hyperintense and T2 hypointense) . Fluorescein angiography may be useful to distinguish between metastatic lesions and choroidal hemangioma. In fact, this vascular tumor shows more prominent early choroidal filling than is usually seen with metastatic lesions . Figure 11. CT-scan showing a supra renal tumor. Biopsy guided percutaneous supra renal tumorbiopsy. Other choroidal lesions can mimic the aspect of amelanomatic prominent mass such as solitary choroidal granuloma, which can be seen with tuberculosis, sarcoidosis, or other known granulomatous disorders, or it can be idiopathic . Choroidal granuloma is an atypical manifestation for ocular tuberculosis and is less frequently reported . Solitary choroidal tuberculoma without any systemic manifestations of tuberculosis presents a diagnostic challenge because it is masquerading as a malignant intraocular tumor . In almost all reported cases, Tuberculosis could be suspected based on a history of previous infection, presence of other clinical active focus of tuberculosis . Choroidal tubercles are usually unilateral but with multiple lesions. Although rare, isolated uveal tuberculoma masquerading as intraocular tumors are a well-known situation . Tuberculoma appears as a yellowish lesion with indefinite borders located in the posterior pole, and may vary in its presentation with features such as associated haemorrhage, striae, or exudative retinal detachment . Figure 12. Fundus biomicroscopy of circumscibed choroidal hemangioma. 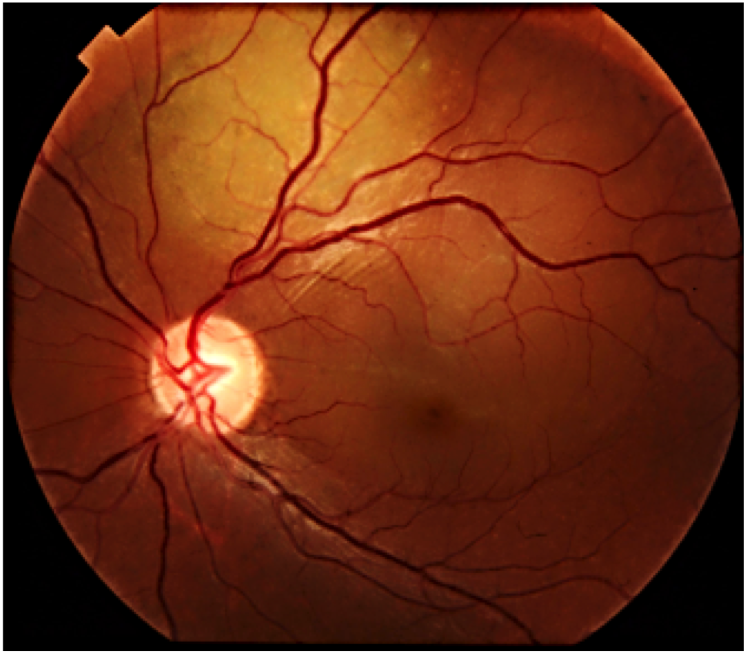 Fundus biomicroscopy showing an orange deep mass in the macular area, with ill-defined edges which produced an infra-jacent retina raising. Generally, retinal vessels overlying these lesions appear normal but exudation and hemorrhage have been reported . A case of pulmonary tuberculosis presenting with choroidal granuloma has been reported by Jabbour and al . They noted an early hyperfluorescence within the lesion that increased in intensity and size over the subsequent phases as the dye leaked into the surrounding serous detachment and late leakage from the lesion. A variation was observed by Milea et al. who described early prolonged blockage and late moderate hyperfluorescence of the tuberculoma. Since there are no typical angiogram findings for choroid tuberculoma, and varying appearances may be noted . Many investigators believe that indocyanine green angiography is a very helpful method for detecting choroidal involvement in granulomatous chorioretinitis . Tayanc et al  performed indocyanine green angiography on two patients with unilateral choroidal involvement. This test showed a hypofluorescent choroidal lesion corresponding to a choroidal tuberculoma that appeared larger in size than on fluorescein angiography. This lesion remained hypofluorescent in all phases of indocyanine green angiography. Among the amelanotic lesions of the choroid, circumscribed choroidal hemangioma can masquerade as a choroidal malignancy. This lesion is a benign vascular hamartomas. Typically, it shows an isolated finding without systemic associations. Their diagnosis can be challenging because of similarity in funduscopic appearance with the other amelanotic choroidal lesions, such as an amelanotic choroidal melanoma, choroidal metastasis, posterior scleritis, choroidal granuloma, choroidal osteoma, lymphoma, or atypical central serous chorioretinopathy. Figure 14. 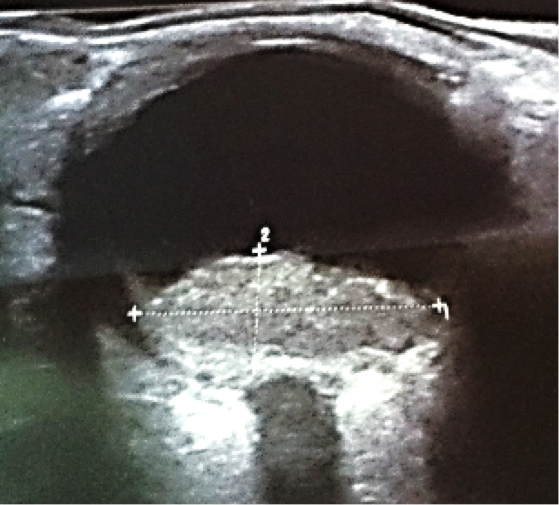 Ultrasonography B scan and color-Doppler ultrasound of circumscribed choroidal hemangioma. A) Ultrasonography B scan revealed a highly acoustic lesion without posterior shadowing. B) Color-doppler ultrasound confirmed the vascular nature of the tumor. On clinical examination, choroidal hemangioma has a characteristic orange-red, unlike choroidal metastasis which tends to be creamy-yellow and amelanotic melanomas which tend to be more yellow tan. A pigmented rim sometimes surrounds the tumor, and subretinal fluid from the tumor leading to an exudative retinal detachment is generally present in symptomatic cases and that can be confused with metastasis . Ancillary testing is very helpful to distinguish these conditions. On ultrasonography, choroidal hemangiomas have a consistent characteristic appearance. It appears as an acoustically solid mass with a high internal reflectivity due to the vascular component of the lesion, in contrast to choroidal melanomas which display low to medium reflectivity . Choroidal circumscribed hemangioma also has a very distinct appearance on indocyanine green angiography with rapid filling and washout phenomenon, unlike choroidal melanoma and metastasis which have slower and less intense filling . 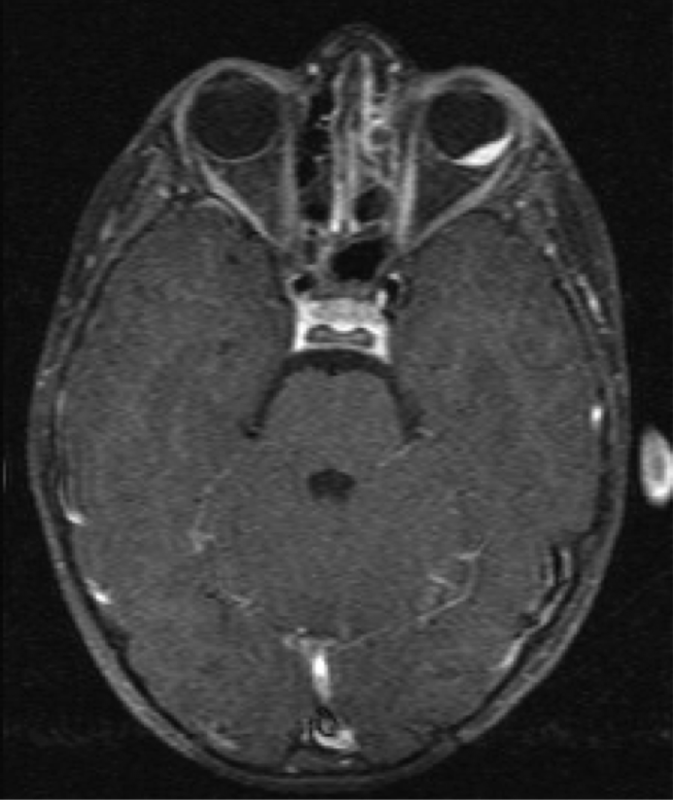 On MRI, circumscribed choroidal hemangioma show bright signal on T1 and T2 weighted images and an enhancement with gadolinium contrast. Whereas choroidal melanomas and metastases show bright T1 weighted images but low signal on T2 weighted images . The pattern of circumscribed choroidal hemangioma on fluorescein angiography can be somewhat variable and similar to other amelanotic choroidal tumors, because a hyperfluorescence of the lesion in the early phase of FA which remains in arteriovenous phase with a variable late leakage which can be seen with the other malignant tumors. Hence, florescein angiography may not be a diagnostic tool in the absence of other ancillary testing . A great variety of lesions, both benign and malignant, may involve the choroid. Some characteristics allow diagnosing them. Thus, bilateral or multifocal lesions are more likely to be metastatic, infectious or inflammatory. Whereas, solitary mass evokes a benign origin or a primary neoplasm of the choroid. Ancillary testing is very helpful to distinguish these conditions, and may prevent unnecessary treatment of some of the benign treatment and avoid in the other hand to misdiagnose a malignant tumor. Knowledge of associated ocular and systemic conditions is also helpful in the recognition of some of these tumors. The authors declared they have no conflicts of interest. Perls M. Carcinose capillarembolie det choriodea. Virchows Arch Pathol Anat. 1872 ;56 :445-8. Kristin JR, Moody DW, Andrew PS. Choroidal metastases. Retina fifth edition, Copyright © 2013 Chapter 151, 2324-2329. Shakin EP, Shields JA, Augsburger JJ. Metastatic cancer to the uvea and optic disk: analysis of 200 patients. In: Bornfeld N, Gragoudas ES, Höpping W, et al. editors. Tumors of the eye. Amsterdam: Kugler; 1991. p. 623–31. Masood N, Asgari RA, Reza S. Choroidal Metastasis: Clinical Aspects at A Referral Ocular Oncology Center. Iranian Journal of Ophthalmology. 2013 ; 25(3) :204-10. Zografos L., Uffer S., Beati D. Métastases intraoculaires Tumeurs intraoculaires. Paris: Société française d’ophtalmologie. Masson (2002) :381-412. Shammas JH. Atlas of ophthalmic ultrasonography and biometry. St Louis: Mosby; 1984. Gass JDM. Stereoscopic atlas of macular diseases: diagnosis and treatment, 3rd edition. St Louis: Mosby; 1987.